The inventory turnover ratio is a financial metric that tells you how many times throughout a period the company converted its inventories in cash for the business. In fact, that can be calculated either by dividing the sales by the average stock or by dividing the cost of goods sold by the average inventory. 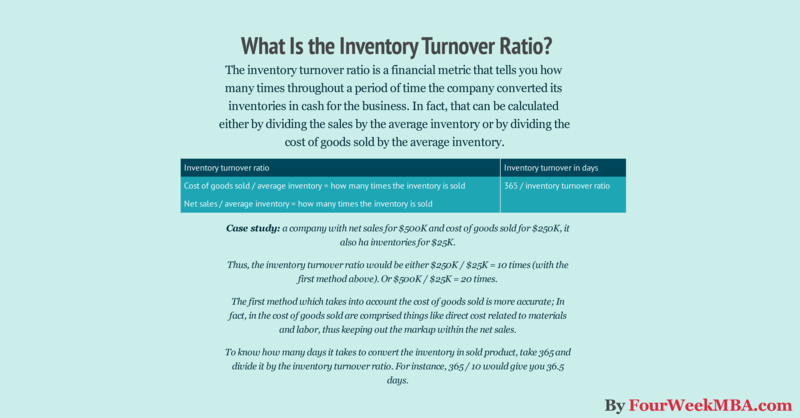 In the next paragraphs, we’ll look at the components you need to understand to calculate the inventory turnover ratio. The inventory is a list of goods a company has on hand to be sold. That is a broad definition as the inventory composition can vary based on the business and industry. Imagine the scenario in which we have a company who sells smartphones; the production gets outsourced. Therefore, your inventories will be mainly comprised of finished products. Imagine the opposite scenario. The company manufactures smartphones. Therefore, the inventories will be comprised of the finished product (smartphones), but also and mainly of components. As you can imagine the value of the inventories from the first to the second scenario will be slightly different. Inventories will be valued according to the “net realizable value” or the amount for which the goods can be sold for after subtracting the expenses incurred to make the sales. As we saw from the example above, if you own a company who manufactures smartphones, the inventories will be comprised of three kinds of goods that can be valued accordingly. We can classify the inventories based on how close they are to being sold. A raw material, for instance, if yet in a state that can’t be sold. In fact, that needs to be processed to become a final product. Typically they include materials that have different values. Example: Imagine, your inventory comprises phone screens. As technology progresses the price of some components decreases. Therefore, your inventory comprises phone screens that range from one year ago up to three months ago. Further, the batches acquired one year ago are valued at $10 per piece while the newly acquired are valued at $8 per piece. Two methodologies can be used in this case: either the FIFO or the weighted average price. The former means First in, First out. Practically the Inventory will be valued at the price of the latest goods received, in our example $8 per unit. In the latter, the price of the goods will be averaged out. For example, the two batches comprise the same number of items or 50 items at $10 in the first batch and 50 items at $8 in the second batch. Therefore, the weighted average formula will be: ((50 x $8)+(50 x $10))/100 = $9 per unit. In conclusion, according to FIFO the value of your inventory will be $800 or $8 x 100 while according to the weighted average will be $900 or ((50 x $8)+(50 x $10)) x 100). In the real world, these items may be considered worthless. Imagine your inventories are comprised of not fully assembled smartphones, either because the screen is missing or the CPU has not been completed yet. How would you value them from the accounting perspective? Well, do you remember what does the going concern principle state? According to this principle, accountants assume the business will continue the operations in the foreseeable future. Therefore, in our example, the smartphone not fully assembled will be valued more in comparison to the raw materials, since the assumption is that the business will continue the operations long enough to sell the finished product eventually. Furthermore, the value of the work in progress stock will include things such as the labor costs incurred in the manufacturing process. In conclusion, they will have a higher value, although very subjectively determined. They are the most valuable items in the inventory as they might comprise finished goods, which can be valued at the net realizable value. There is another element to take into account for the sake of the inventory turnover ratio formula: the cost of goods sold. The cost of goods sold represents the cost incurred to turn the inventory in a finished product ready to be sold. That includes direct costs of materials and labor for processing the inventory and make it translate into the finished product ready for sales. That’s why the cost of goods sold is also called cost of sales. There is no way you can sell what you have in your inventory (unless you have the finished product) before it gets processed or you acquire the materials needed to build it. The main aim of the inventory turnover ratio is to have a clear metric that can tell you how fast you convert your current assets (assets that can be converted in cash within a year) in cash that can be used to grow the business. For the sake of this discussion, we’ll take as inventory turnover formula the cost of goods sold and divide it by the average inventory. Why? That measure is more accurate. In fact, the inventories stay tied to the cost of goods sold, way more than the revenues. In fact, in the net sales number, you’ll have things like the markup which do not allow us to have a complete overview of the inventory management. Let’s take the example in which a company has spent $300K in direct costs of materials and labor to produce the finished products. Imagine now that company has an inventory value of $30k. How much would its inventory turnover ratio be? That means the company can convert its inventory in finished products that get sold ten times in a year (if we compute it on a yearly basis). How can we interpret it? The inventory turnover ratio can help us assess if a company is efficiently managing its inventories. In short, if it is converting them fast enough in finished products that get sold to grow the business. In general, the higher the number, the better. However, financial management metrics can tell us something only when we do at least two kinds of comparison: first, what is the value of the inventory turnover ratio compared to the previous years. Second, how the inventory turnover ratio compares to the same industry. Finding an optimal inventory turnover ratio is critical. Yet there is no fixed number. Of course the higher the inventory turnover, the better. It is essential to keep in mind that the inventory turnover ratio is not an end in itself but it needs to help you assess several parts of the business that affect this number. Comparing it with the previous years and the competition is a sound methodology. Yet when the inventory turnover ratio becomes too low, you want to look at several factors that might be affecting it. For instance, sales processes, suppliers contracts, and relationships, or inventory management systems are all way to tackle a low inventory turnover. Things like accounts receivable accounts payable and inventories comprise the so-called current assets. The way you manage your current assets is critical to the long-term success of the business as you might end up lacking the short-term liquidity to run the operations. Thus, things like the receivables turnover ratio, combined with inventory and payable turnover ratio make up the so-called cash conversion cycle. Companies like Amazon have built their success on a successful cash conversion cycle management. Think of the case in which you manage to have low inventory at hand, while get paid fast by your customers and managed to have an extension in terms of payments toward your suppliers. This scenario would unlock liquidity in excess that you can use to grow your business. With a simple additional step, we can assess how long it takes for a company to convert its inventories in sales. For instance, Amazon has an inventory turnover ratio of 9.84. If we divide 365 by 9.84, we get 37 days. In other words, it gets 37 days for Amazon to convert its inventories in selling products that give cash to the business operations! In fact, the way the inventory gets managed is highly dependent on the industry. However, as technology can help companies like Amazon and its business model to run with the low inventory at hand, those companies can gain competitive advantages over their competitors. From the analysis of Reuters, you can see how Amazon inventory turnover ratio compared to the sector is way lower. In other words, Amazon is able to generate cash from its operations. Since the early 2000s (probably since the start) instead of distributing that cash as a dividend to shareholders. Amazon has used the extra cash to improve its operations on the one hand and passed it over to customers as lower prices thanks to an improved cost structure. This allowed Amazon to host third-party stores which speeded up the selection and variety of products available on Amazon.com.